The controversy over relieving IG Kunwar Pratap Singh as member of the special investigation team (SIT) probing the Bargari sacrilege and firing incidents panned further with several posters and hoardings coming up in Ludhiana with messages such as “Badal Dal Harao, Punjab Bachao (defeat Badal’s party and save Punjab)’, and BJP Harao-Desh Bachao, Modi Harao- Savidhaan Bachao (defeat Modi and BJP, save India and the Constitution)’. 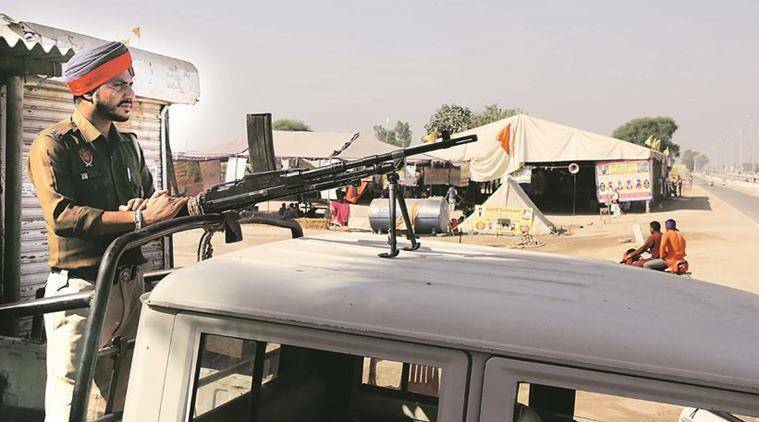 The families of the two men killed in the police firing during the “anti-sacrilege” protests in 2015 have criticised the transfer of the officer on EC orders, claiming that the poll watchdog “played into the hands” of the BJP government at the Centre only to save the Akali Dal and the Badals. The United Akali Dal has planned a dharna outside the election commission’s Delhi office on April 12 to protest against the IG’s transfer. Dhyan Singh Mand, the parallel Jathedar of Akal Takht declared by Sarbat Khalsa 2015, has issued a one-week ultimatum to the ECI to cancel the transfer order. Sikh Talmel Mission convenor Santokh Singh said, “We have called the meeting to discuss the strategy to defeat Badals and the BJP in the Lok Sabha polls. They are the culprits of Guru Granth Sahib. They got IG Kunwar Vijay Partap transferred as they were afraid that this SIT member could expose them in the due course of inquiry”. Sukhjinder Singh, a member of the Mission from Batala, said, “The focus of meeting will be more on Modi’s efforts to save Badals from investigation on sacrilege and Behbal Kalan firing issue. It is a one-point programme”. He said that organisations like Sikh Vichar Manch, Guru Granth Sahib Satkar Committee, Ek Noor Khalsa Fauj, Kalgidhar Sewak Jatha, Guru Nanak Mission Lehar and several other organisations attend the meeting. “The SAD’s move has backfired. People are angry. Sacrilege happened during their rule. How can we forget it,” Sukjinder said. The outfits coming to attend the Thursday meet had actively taken part in protests across the state over the sacrilege of Guru Granth Sahib. Gurdeep Singh Bathinda, secretary general United Akali Dal said, “Our party will take out a march from Bangla Sahib Gurdwara in Delhi to the ECI’s office and stage a dharna against the politically motivated transfer. No doubt there are other members of SIT as well, but credibility of an honest officer has been questioned at the behest of Badals, who want to save their skin”. He added,”Badals often speak against the organisations who were part of the Bargari Morcha but have they ever spoken even a word against Dera Sacha Sauda head Gurmeet Ram Rahim Singh who is now behind bars. This shows their double standards. But people won’t be fooled any longer. They will give them a reply this Lok Sabha polls”.